Despite bringing a strong cast of climbers to Innsbruck world championships, the Colombians cannot crack the top-10 on a mountainous course. Colombia lined up with its two-wheeled version of a “dream team” Sunday in Austria yet barely punched into the top-20 in UCI World Road Championships. Far from the final podium, Colombia fell flat in a climber’s paradise that — at least on paper — suited the “escabarajos” perfectly. Nairo Quintana saved national pride with 15th at 1:21 back but that was far from where Colombia hoped to be in what was its best chance at the rainbow jersey in a generation. Quintana was the last man standing for the highly touted Colombian team that brought Sergio Henao (Sky) and Rigoberto Urán (EF Education First-Drapac) as pre-race leaders. Quintana and Miguel Ángel López (Astana) were also protected by an equally stellar support squad. So what happened? Henao and Urán, arguably the two best one-day racers on the Colombian team, couldn’t match the fierce pace set on the last lap by France, Italy, and the Netherlands. López was already dropped from the elite group before the decisive accelerations. Urán, second in the 2012 Olympic road race, and Henao both lost contact before the final “Hell” wall when France’s Romain Bardet (Ag2r La Mondiale) opened up the race-breaking selection. That left Quintana, who has only won a single one-day race in his career with the 2012 Giro dell’Emilia, carrying the national colors. The result was a letdown for Colombian fans hoping for their best chance at the rainbow stripes in a generation. Santiago Botero, who won the world time trial title in Zolder, is the only Colombian to win a rainbow jersey in the elite men’s races. Despite its long-running success, especially in stage races, Colombia has never won an elite men’s road race world championship medal. All four of Colombia’s riders came off a very hard and highly contested Vuelta a España, and that effort seemed to cost them during the challenging road worlds circuit. 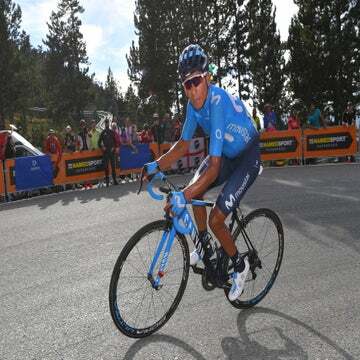 Urán and López, seventh and third respectively at the Vuelta, lacked their typical punch in the race. Henao, who was riding in support during the Vuelta, also struggled when he was expected to be one of Colombia’s best bets. Urán was 33rd at 2:57 back, Henao 48th at 6:02 and López pulled off before the final lap — they were far from being the protagonists many expected at the start of the race. Quintana at least could celebrate the victory of professional teammate Alejandro Valverde. Quintana gave his Movistar “compañero” an emotional hug following Valverde’s moving victory Sunday. Colombia won’t have to wait long for another shot at the rainbow jersey, however. Fernando Gaviria, the ever-improving sprinter and classics rider, will be among the top favorites in Yorkshire in 2019.